Q: Do you recommend dividend-paying stocks? 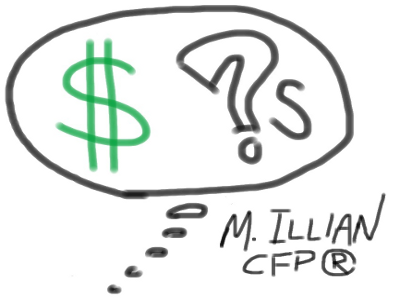 If not, what investment strategy do you recommend for retirees like me who are seeking income from our portfolios? In my previous post, I focused on the disastrous consequences of inflation for the investor who relies primarily on dividend income. In good times, inflation causes a slow attrition of your purchasing power, but in the bad, hyperinflation will entirely decimate an income-focused portfolio. Another great risk that often gets overlooked is equally pernicious. Dividend investing sounds so safe. But when rates are low, investors begin what I call “toxic reach,” which occurs when investors unwittingly allocate resources with companies in poor financial condition, some on the brink of bankruptcy, to achieve a seemingly rosy dividend yield. Companies boasting above-average dividend payments should be a warning flag that investors too often overlook. A good example comes from a National Geographic television show I enjoy watching. In the episode “Wicked Tuna,” fishermen in the North Atlantic are hunting large bluefin tuna. With full-grown adult fish averaging 770 pounds, you can imagine the hunt is quite exciting. Modern sonar technology allows these fishermen to bring in a much larger catch than their predecessors could. However, their livelihood is not sustainable. Bluefin tuna are now at 25% of their 1950 population levels and expected to be on the endangered species list very soon. If you only looked at the annual tonnage of bluefin tuna, you wouldn’t recognize that the industry is on the verge of collapse. During this period of low interest rates, significant marketing dollars are being devoted to advertising the benefits of dividends. 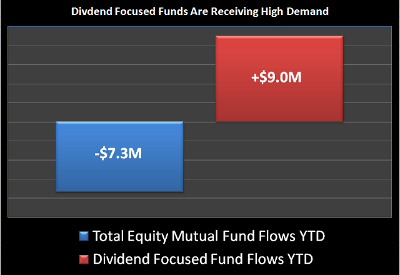 So far this year, the Wall Street Journal reports that $9 billion has been invested in funds that focus on stocks paying high dividends; all other stock funds combined have had a net outflow of $7.3 billion. And as the price of these high-dividend companies is bid up, the risks increase. 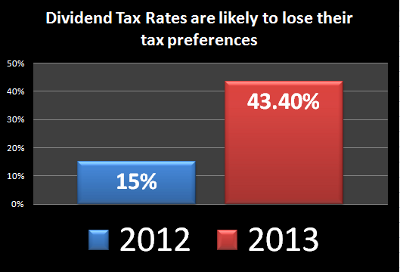 You should also consider that dividend-paying stocks could stand to lose an important tax preference by next year. Most dividends currently are federally taxed at the 15% rate, but that could jump to 43.4% for investors in the top income tax bracket. An intelligently diversified portfolio does not exclude companies that forgo paying a dividend. In fact, our research tells us that dividend stock valuations are looking less attractive now than their non-dividend-paying counterparts. We seek portfolio growth from investments that produce both capital appreciation and income. A retiree should enjoy both.